PACKED with PROTEIN! 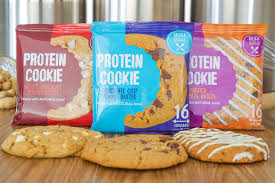 Not only is this cookie the perfect flavor combination between peanut butter and rich chocolate chips, it also contains 16 grams of protein! Consider this the all-natural, protein-packed treat that you can’t beat! INGREDIENTS: Semi-Sweet Chocolate Chips (Cane Sugar, Chocolate, Cocoa Butter, Milk fat, Soy Lecithin [Non-GMO Source], Natural Flavors), Organic Coconut Palm Sugar, Protein Blend (Milk Protein Concentrate, Whey Protein Isolate), Organic Peanut Butter, Honey, Roasted Peanuts, Organic Virgin Coconut Oil, All Purpose Flour Unbleached, Natural Peanut Flavor, Organic Whole Eggs, Peanut Flour, Filtered Water, Natural Vanilla Flavor, Baking Soda, Salt, Citric Acid.